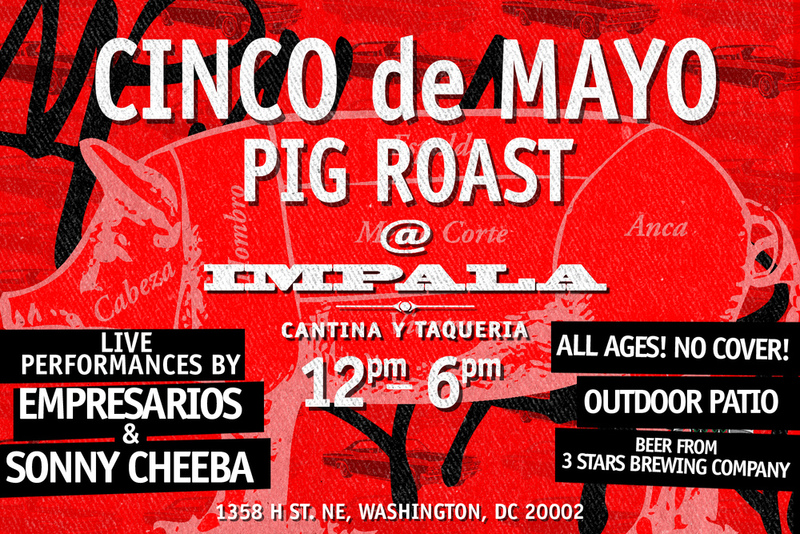 We put together an event with the guys from the heavily anticipated H Street restaurant, IMPALA CANTINA for this upcoming Sunday afternoon 12pm-6pm in celebration of CINCO de MAYO. Think GIANT outdoor PIG ROAST with LIVE LATIN MUSIC, a DJ, beer and margaritas all in the spirit of an old Mexican styled family party. I know most of us in the city have been patiently waiting for the full IMPALA restaurant to open since the 'winter season only' H street Tacos Impala stand ran last year. They've since obtained an AMAZING building right in the heart of the street and the build out is nearing final completion. Classic Mexican food in a one of a kind environment will soon be upon us. ★ Live Music from Fort Knox Recording artists, EMPRESARIOS and DJ sets from SONNY CHEEBA. ★ A GIANT PIG ROAST plus lots of extra food specials. ★ $5 beers. $7 margaritas. ★ NO COVER to enter.